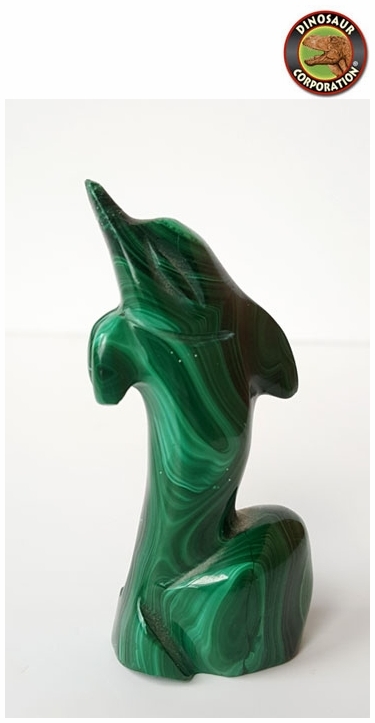 Finely detailed hand-carved malachite Dolphin figure from South Africa. The dolphin is jumping out of the waves. This beauty does stand up on it's own base. A perfect birthday gift for Dolphin lovers. Greek mythology tells us that Dolphin Spirit carries the spirits of the dead to the next reality. From a symbolic standpoint this gives Dolphin the additional meaning of rebirth and renewal. ... Throughout the process of change, Dolphin provides courage, self-confidence, virtue and strength to endure tumultuous waters. Note: Malachite absorbs negative energy easily, but holds it within the stone until it is cleaned, so it is important to �clear� your Malachite often. See the News article in the left navigation that offers some methods of clearing your crystals.